There was a request to expand the crew complement to include pilot personnel and to identify training requirements. It was also suggested that pallet modes should be evaluated as well as laboratory simulations, and that the programme should be continued, but with a less confusing acronym. The concern for the FOD was that, by going agency wide, they would lose control of the tests - with integrated training ending up with Marshall or Kennedy Space Center - and that by offering other centres participation, it might remind too many people of the CVT series. Broadening the range of PIs beyond JSC was thought to be a good move, however, especially if there was more than one additional run planned. Whatever the plan, Bob Parker recognised that any proposals had to be "very well prepared, and we need to proceed carefully.'' As a result of these conversations, Ames Research Center became a major contributor to the third SMD, which was finally agreed to be of sufficient interest and importance to schedule for the summer of 1977. Support scientists and controllers monitor the progress of a Spacelab simulation. itself and his physics background, coupled with medical training and astronaut experiences, provided a valuable asset in arguing the case for the CB in developing the simulation. 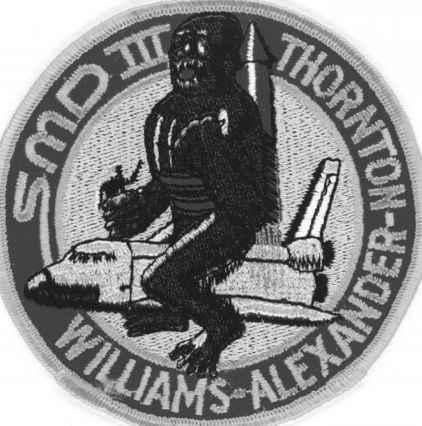 Emblem for SMD-III showing a primate riding the back of the Shuttle holding an astronaut in his hand. To the crew this emphasised the difficulties in handling the animals in the holding facility and in particular one awkward monkey. string manipulated by a 'cookbook schedule' from controllers and investigators following his every move on the ground.'' With the complexity of these experiments, Thornton emphasised that it was imperative that the MS and the PS should aim their training to be an extension of the principal investigators. Thornton was assuming the developing CB role that would see the mission specialist on a Shuttle/Spacelab flight being responsible for the scientific success of the mission and the lead scientist on board, as well as assuming other vehicle and mission responsibilities. Thornton also expressed concerns about the way the selection of payload specialists might be amended at short notice, adding to the programme costs, diluting joint efforts and increasing the load on the MS. Apparently, the division of experi ments between the MS and PS was agreed to ensure they shared the load in the simulation. A tentative selection of PS was made between NASA JSC and NASA Ames and unofficial joint "training" was being accomplished to an acceptable degree. But news that the PS selection might not be ratified and that Ames was looking to train its own selection (plus a second, less qualified person in parallel, to make the final selection shortly before "flight") did not go down well at JSC. There was even a rumour that the JSC PS selected might be replaced by a second person of unknown technical experience. If such a move were made, it would be very difficult for the MS on the simulation to ensure mission success. A long training programme with a familiar crew had already produced good results on previous space missions. The CB would wish to continue this proven system and would seek considerable input into selection of the SMD crew. Even though they would not fly in space, it was important to establish clear guidelines that were applicable to further flight crews. Making a politically attractive selection just prior to final selection of the SMD crew would not help smooth out the differences between the field centres as the first flights of Shuttle and Spacelab approached. 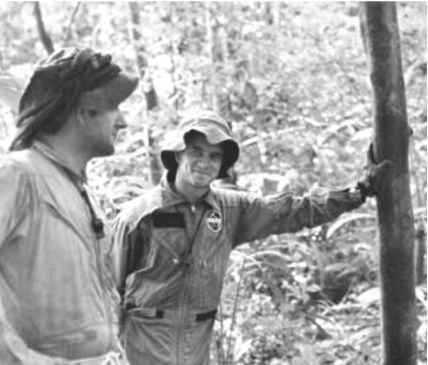 In preparation for the simulation, Thornton held discussions with former Skylab astronaut Alan Bean and other "physical sciences astronauts'' in order to determine the most appropriate training process. It was decided that the two PSs would share responsibilities as both primary or back-up on the range of experiments, to provide dual coverage and redundancy where required. The prime experimenter would receive training to a level of knowledge that allowed routine performance of the experiment, and for being prime contact for the investigators and PIs, as well as being the leading troubleshooter for that experiment. The back-up experimenter would only receive a level of training sufficient to be able to substitute if required. As MS, Thornton would receive enough training on all the experiments to allow him to "cookbook" all bar the most complex. He would become familiar with all the goals and limits of the experiments, be responsible for the overall troubleshooting, and serve as prime experimenter on appropriate experiments. Reflecting some experiment difficulties encountered during Skylab, Thornton was aware that, although some experiments looked good on paper, the research behind them was poor and they would require much more involvement than was indicated. One such experiment the astronaut cited called for the simple throwing of a switch, but in reality, it featured tens of data channels, changing of film, manipulation of boiling water and monitoring and tweaking of several channels. It was suggested that the crew should have full indication of the experiment and intended input as early in the training flow as possible, with equipment as close to flight standard as possible, in order to both attain the necessary skills and techniques to operate the experiment and to understand its objectives and the specific individual requirements of the crew member. Dr. Bill with his monkeys ... one of the more challenging assignments for the scientist-astronaut, in more ways than one. 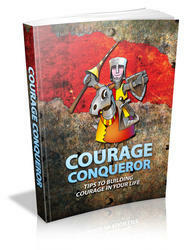 around with makeshift apparatus and procedures thrown together by a crash team on the ground." The medical experiments were also being revised to a more manageable package by the new head of the Life Science Directorate, Sam L. Pool. The "friendly doctors" wanted the simulation crew to perform seven days of isolation and a physical every day prior to commencing the simulation, record all food eaten and all waste products and undergo a nightly medical report. In addition, it was important to test elements of crew equipment prior to installing them in the SMD programme. A case in point was the planned Shuttle Waste Management System, which had failed many times in simulations. Thornton expressed the hope that someone was working on the system to solve the problem prior to its inclusion on the Shuttle, so that the Skylab WMS difficulties were not repeated. By 1 December 1976, the prime and back-up PS were undergoing medical tests as part of the evaluation to gather baseline data for future PSs on Shuttle flights. The PS group consisted of W. Carter Alexander, PhD, of JSC, and Bill A. Williams, PhD, Patricia S. Cowing, PhD, and Richard E. Grindeland, PhD, all from NASA Ames Research Center at Moffett Field in California. Thornton was accompanied on the simulation by Alexander and Williams, using the high-fidelity laboratory and crew module mock-ups between 17 and 23 May 1977. 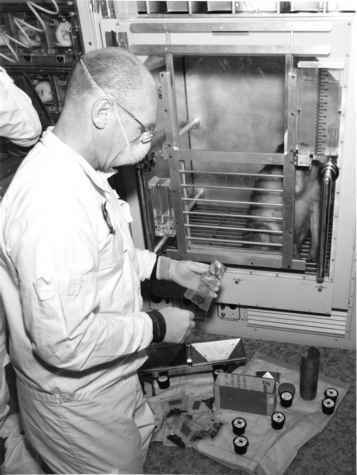 Twenty life sciences experiments from Ames and six from JSC were operated, with medical monitoring and health service provided by Thornton.